You can retrain your deep abdominal muscles and increase your core stabilization by using isometric exercises for stomach strength and core stability. Most people are sedentary, overweight, inflexible, and have bad posture, and all of these things can be associated with back pain. In a study done by physiotherapists in Australia, the researchers concluded that people who suffered from chronic lower back pain could not efficiently contract and work their stomach and ab muscles. In other words, they believed that an inability to efficiently contract/ flex the core muscles was connected with chronic lower back pain. To improve core stabilization, the therapists used isometric exercises for stomach muscle activation as well as traditional strengthening exercises for the core and entire body. In this study, there was an emphasis on the deep abdominal muscles, especially the transverse abdominus. Simply put, some of the abdominal muscles are organized in layers. The superficial muscles are closer to the skin and the deep muscles are closer to the spine. Generally speaking, the superficial muscles help more with movement and the deep muscles work isometrically to help more with keeping the spine and lower back stable and supported by(note: they all work together to do both). So in order increase the support for the lower back you must retrain the deep muscles and transverse abdominus to work more efficiently. In order to do this, I often recommend isometric exercises for stomach muscle activation. The Plank: The #1 Isometric exercise for Stomach Strength! The plank is a great exercise to retrain your ab muscles to work more efficiently. It is an isometric exercise for the stomach. "Iso" means "same", and "metric" means "length". Isometric literally means same length, or isometric simply means that you hold one position without moving. The secret to getting the most out of this exercise is pulling your belly button towards your spine. When you pull your belly button towards your spine, you engage and retrain the deepest abdominal muscle to support your back. When personal trainers and pilates instructors say to pull in your stomach, they are saying this to cue you to draw your belly button closer to your spine. When I worked with Bounce Back Fitness (Bostons First Outdoor Mom and Baby Bootcamp), the plank was a staple in our core and ab routine. It was always very challenging for new mothers whose babies were less than 8 weeks old. When a woman is pregnant the ab muscles get stretched out and stop working as well as they should. After having a baby, new mothers need to focus on retraining their body and their core muscles to work again. And the plank is a great way to recondition your ab muscles. When you are doing complex movements it is harder to truly focus on the abdominal muscles, but you can focus solely on your core when you're doing isometric exercises for stomach strength and coordination. Similarly to having a baby, if someone is really overweight the tendency is for the ab and core muscles to be over-stretched, so it is important to build a strong foundation with exercises such as the plank. If you are like most guys, your weekly routine likely starts out with chest and bicep exercises on Monday and ends with chest and bicep exercises on Friday night before hitting the clubs. It's all good, I'm a little vain too, so I always make sure I work my arms--in fact I have a pair of 25 pound dumbbells next to my desk in my office... they're perfect for giving me a postural break from the computer. Anyway, so many big strong guys neglect their flexibility, balance, and core and that holds them back from making additional progress. So even if you have great pecs and great arms already, I recommend that you work your core a little also. Client Story: I remember working with a huge 200 pound ripped guy a few years ago... he came to me because he was having trouble with his lower back during his workouts, especially during leg workouts. At any rate, part of my advice included working on flexibility and core strengthening. He had never tried isometric exercises for stomach and core stability. The first time I had him try the plank exercise, he was shaking like a leaf after 15 seconds and could barely make the full 30 seconds. He was amazed that his abs were so weak compared to the rest of his body. Because he was lean and had a 6 pack he thought his abs were strong enough, but I had to explain to him that even though his abs looked good that didn't mean that they're strong enough to support his back when he was squatting 300+ pounds. 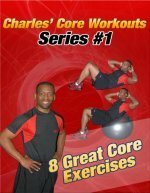 After 1 month of stretching and a ton of core work, he was able to get through his entire leg workout without any back problems, and he attributed much of that to his new favorite ab exercise... the plank, which is the best of the isometric exercises for stomach strengthening and core stabilization. How can the Plank Exercise Help Me? If youre wondering how balancing on your elbows and toes will help with your ab and stomach muscles you should give the plank a try. The weight of your body and gravity will pull the middle of your body towards the ground, and your back will have the tendency to sag and arch. To prevent this you must use your ab and stomach muscles and pull in your belly button to keep your body in good alignment. If you are a beginner, you may notice that your body starts to shake after a few seconds of holding the plank position. This is simply due to a lack of coordination and strength in your core muscles. Over time, potentially in as little as two weeks youll notice significant improvement in your ability to hold this position without wavering. If this exercise feels really easy by itself, try doing another exercise beforehand to slightly fatigue your stomach muscles. Start with a set of crunches and then turn over and immediately hold the plank position. This will increase the intensity of the plank and give your abs more of a challenge. There are so many ways to work you abdominal muscles. Master the basics and the skys the limit. Use isometric exercises for stomach and ab workouts, and use traditional exercises for your abdominal workout routine. Dont forget to have fun working out. Challenge someone you know to a plank contest. Winner gets a back rub, lunch, cup of coffee, or maybe just bragging rights! Get a stop watch and hit start when both of you are in the plank position. Then, just hold as long as you can. Whoever stays up the longest wins! Starting Position: Start by balancing on your elbows and your toes, while keeping your body in a straight line. Form: This is one of the three isometric exercises for stomach muscles that I use regularly. Hold the same position for 10-30 seconds without moving. Personal Trainer Tips: Make sure that you keep your body in a straight line. When you are doing this exercise for the first few times, your body may start shaking. This is a result of muscle weakness and lack of coordination. After a little practice the shaking will stop and you will be able to hold this exercise for 30 seconds or more. If you feel your back arching, lift your hips slightly higher in the air. Starting Position: Start by balancing on your elbows and your knees, while keeping your body in a straight line. Form: This is an isometric exercise for the stomach, which simply means that you hold the same position without moving. Hold for 10-30 seconds. Personal Trainer Tips: Begin with the half plank if you have difficulty holding the full plank for less than 10 seconds. Build up to 30 seconds on the half plank and then graduate to the full plank. Use a pad for your knees and elbows for comfort. It is important to include isometric exercises for stomach and abs in your workout routine because they enhance core stability, support good posture, and protect your lower back from excess strain. Use them by themselves or incorporate them with other exercises. Once you've mastered the plank, try the side plank. Or try these advanced plank exercises on a stability ball for your abs and lower back.